Today I’ve done a lot of painting, I got up early and I kept at it for most of the day. 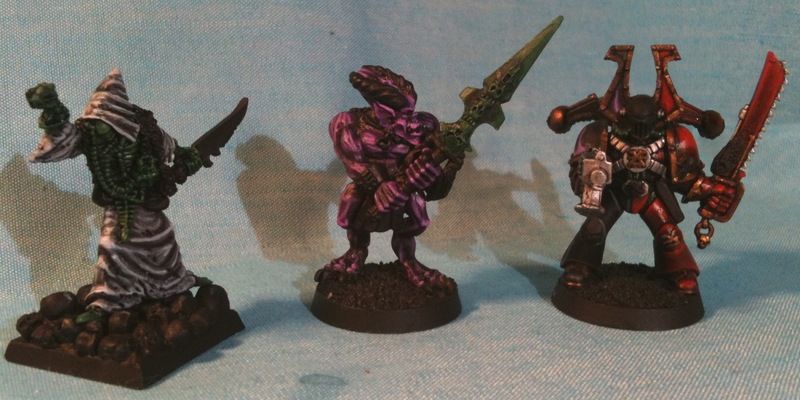 I’m working on three different chaos models. The first is my second test bezerker, the second is an old OOP Bloodletter which I’m painting up to be a generic lesser daemon, but mainly I’m practicing my dark purple skin tone technique, the final model is another old chaos model, this one is still in print, non-the-less mine is lead and will serve as a Herald of Tzeentch come Sunday at Strategies. What I really should be working on is my Astronomi-con Vancouver army, but their is a method to my madness. The Khorne Bezerker is serving as a test model for my Forgeworld Khorne Terminator Lord conversion. The Bloodletter is a test model for a bigger daemon. Even the sorcerer could be argued that it is a test model, as I need to get that flashy look for my Slaneesh Sorcerer I’ll take to the tournament. Well with all the time I put in, I could have put in even more, and none of the models are finished. I had hoped to start on three other models today, but tomorrow will do. I did a lot of work on the Bezerker’s red armour, the Bloodletter’s purple skin, and the sorcerer’s grey robe. So the greens on the Bezerker are for his seems or tubes or whatever. I painted them Orkhide Shade then tried to go right to Sick Green but it ended up looking way too Christmas tree-ish. I then mixed a darker green for the other models. I also had troubles getting the green in the tiny gaps without damaging my red or grey highlights. The other thing I did on the Bezerker was it’s ‘silver’ metallic stuff. 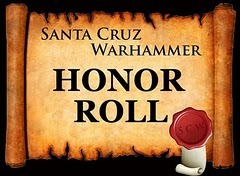 I didn’t use silver, but rather GW’s Chainmail. This was way too shiny, so another dark gunmetal colour would be nice too. 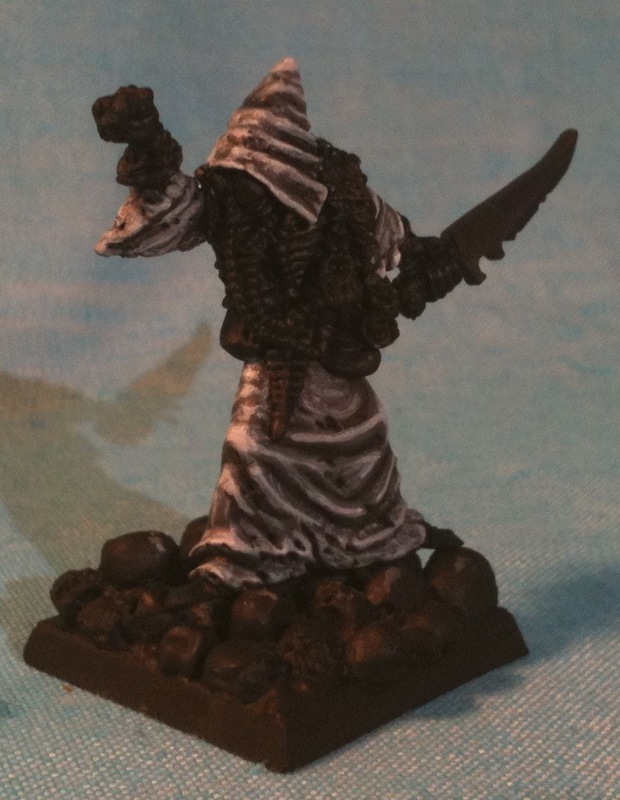 I can darken Chainmail with Badaab Black and Devlan Mud wash but there is always a risk of spillage or seepage, so I think I’d prefer an even simpler metal. 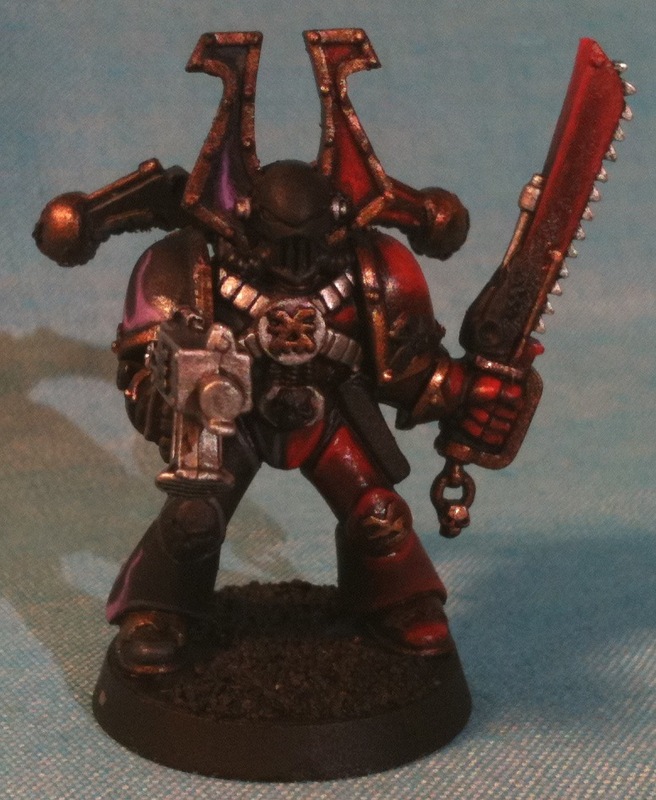 I have Boltgun Metal but I think something even darker than that would find many uses in my painting. The Bloodletter got his skin finished off. It came out pretty well, but eventually I just had to say enough because I have bigger models to work on and I need to get them done within two weeks. 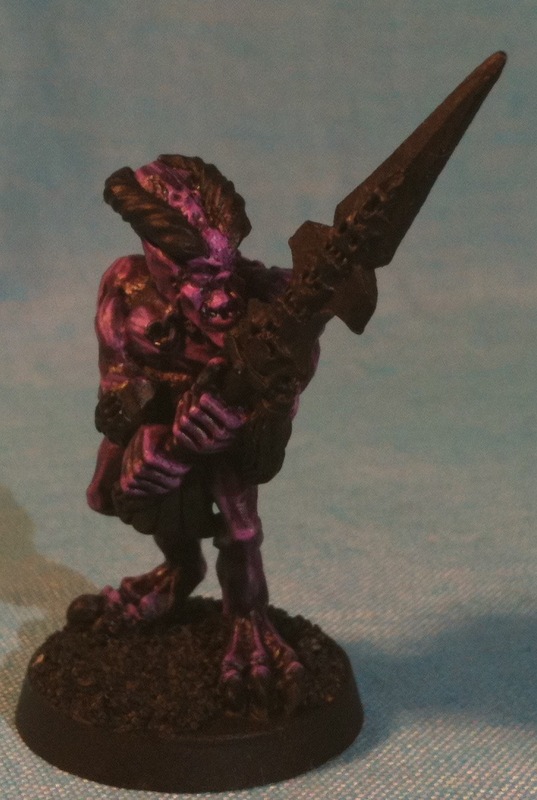 Thankfully I’m unemployed… The skin was painted GW’s Liche Purple twice. I let black come through, I missed painting a little bit of stuff on one shoulder, I thought it was a necklace but it was his collar bone. After that I think I did the first part of Foundry’s Royal Purple Triad, but perhaps before that a custom dark purple wash. Then I worked up the Royal Purple Triad followed by a thinned old purple wash. Then it was basically Royal Purple Triad Highlight along with some glazes. I might go slightly pinker maybe to Warlock Purple on the big fella, we’ll see how it looks and how much time it takes. I also did some striations. Yet another place where I needed a good sharp point. I actually have some really tiny brushes, but I need zeros and double zeros too. The Sorcerer got a pretty surreal grey robe. I didn’t use that many different greys, basically just GW ones, two Foundation ones, and one regular one. In fact I chucked out a light grey, which doing some infantory I think I need four colours and I’m going to try non-GW ones, preferably in the dropper style bottles. Sometimes they come out too much, but generally they are pretty easy to work with, for super common colours I like the flip tops like black and white or metallics which I keep out of my P3 Wet Palette. The robe got a wash of Badaab Black but that didn’t go as well as I would like so future washes were custom made by me out of old Black GW Wash. I did two, one thinned and one really thinned. I also built up the highlights to Astronomicon Grey, but then I went even higher mixing in some white. I also painted in lowlights. This was partly to get rid of unwanted shine, but mainly as it looked good. I got the aforementioned thin brush and painted black lines into folds. I also painted on more folds than were sculpted using various greys. This is a technique I use on skin too, such as the striations. After I was satisfied with the robe I touched up the black and waited until the Bezerker was ready to do green. I wanted a different green, working towards an old pot of GW Jade Green, possibly going even brighter. I started off with Orkhide Shade, leaving some black showing on all three models. Then I did a mix of Orkhide Shade and Vallejo Model Colour Sick Green. Finally pure Sick Green was applied then a custom wash made from an old GW Ork Flesh Wash mixed with a tad of Shadow Black Ink. Then I deemed them good enough for tonight and tomorrow I will finish them mostly and try harder to find a job. I might go out tomorrow night, so I don’t think I’ll put in as many hours painting, but I’m in the home stretch for all three models, so it will be time to work on three different Chaos Space Marines.